The golden embossed linen textured book is compact enough to carry on your travels, to work, to school, in your purse, etc. The small devotionals take only moments to read. Each have a variety of scripture for reference. I found many of the chapters to be exactly what I needed. One such chapter was about Helplessness. With compassion and insight, the words lifted my spirit and gave me that added boost I needed in my daily meditation. 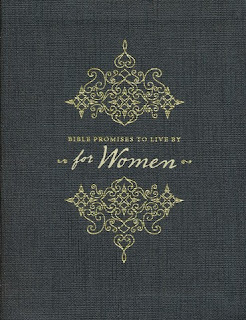 This is a perfect gift for any women, young and old. 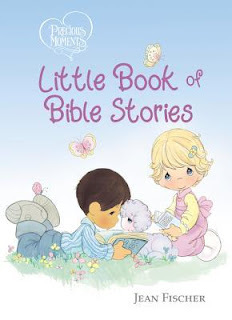 Precious Moments Little Book of Bible Stories by Jean Fischer is the perfect board book to introduce a toddler up to a young reader to well known Bible stories. Many of the Old Testament stories include Genesis' story of creation, Noah, Abraham, and Moses; David, Daniel, and Jonah. After Jonah, the young reader reads about Jesus' birth. One of the things I liked about this story is the inclusion of "The Lost Sheep". This parable told by Jesus is often overlooked, but one of the best stories for children to learn. I have a soft spot for Mark 4:39, so it was my utter delight to see the chapter "Jesus Calms the Sea". The classic "loaves and fish", plus the story of his crucifixion and resurrection was next. The book wraps up nicely with "Jesus Lives" and the commandment to go and spread the Good News!